Aluminum roll-in docks are a perfect solution for your lake home or cabin. Providing unmatched in-and-out-of the water capability, aluminum roll-in docks install with minimal effort, and offer such features as removable, custom fit aluminum or cedar panel decking. All aluminum frame roll-in docks are available in 4′ and 5′ widths and come standard with a dual-winch system for easy leveling, wheels, full-width 2″ galvanized axle, and cross chains for greater stability. Constructed of high quality marine alloy aluminum for maximum strength and durability. Aluminum is completely rust proof and corrosion resistant. Weather or ultraviolet rays do not effect it. Vertical lift members are constructed of aluminum and include a molded pulley cover. Modular Design: The modular design of Porta-Dock’s roll-in (rolling) dock allows endless options when creating a layout that fits your exact needs. Available by sections, you can build your system as your needs and budget grow. Designed for easy use for Minnesota and Wisconsin lakeshores. 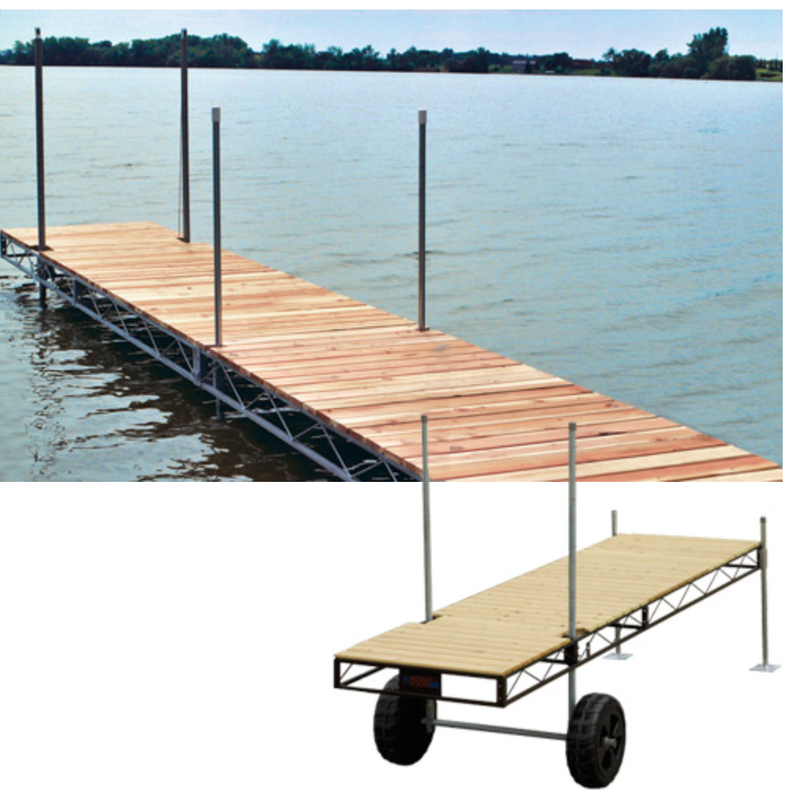 Light Weight Aluminum Frame: Our roll-in dock offers superior stability, ease of installation and years of use. Available in 4′ and 5′ widths, each frame allows for easy installation of decking panels. Maximum aluminum thickness and interlocking (tongue and groove) decking welded to the dock frame makes this the sturdiest dock on the market. Features a baked on textured enamel finish for skid resistant decking. The galvanized or powder-coated steel roll-in docks come with the stylish look and natural beauty of cedar decking. The modual design allows for endless options when creating a dock layout that fits your exact needs. Available by sections, you can build your system as your needs and budget grow. Not available with aluminum decking.